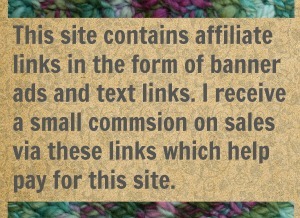 As I mentioned in a previous post, my friend and founder of Noti Yarns, landed her first account in a yarn shop last week. There was celebrating. There was late night strategy sessions for how her yarn company would one day rule the world. There was also a request made to yours truly for a little knitted sample to show off how all her solid colors work up. 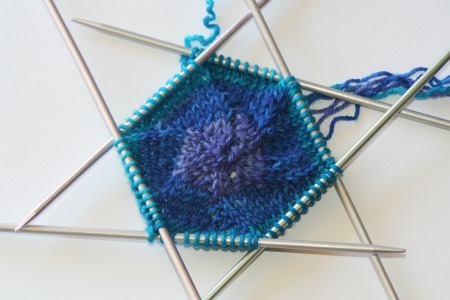 So for any knitters who want to fiendishly trap hapless yarn lovers make a framed knitted pinwheel, here is the pattern (its dead simple) and a photo tutorial. 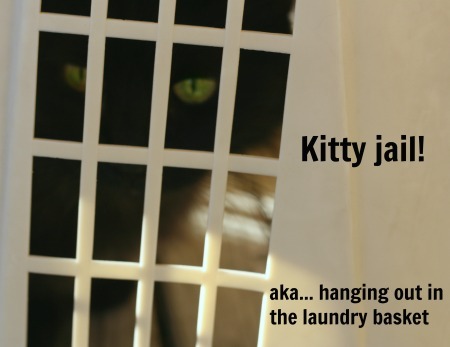 This post was part of the 39th Blog hop at www.mittenstatesheepandwool.com! 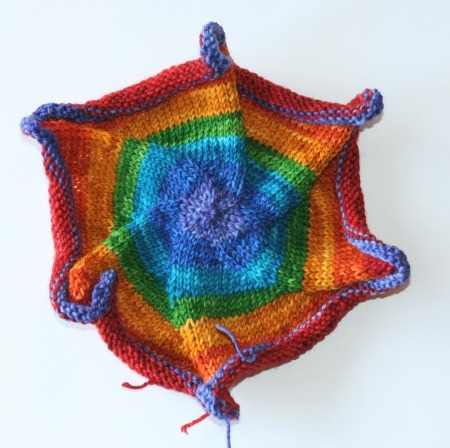 Pinwheels can be made with any size yarn and worked up to any size. Knitter’s choice. 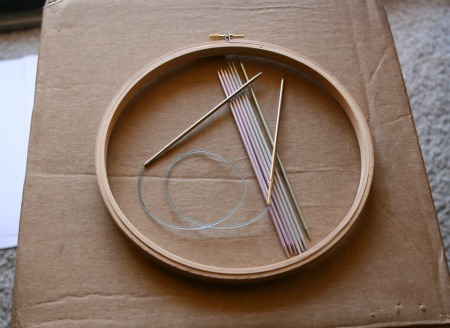 They are worked in the round, so you’ll need either a set of circulars that you can magic loop with or double points. You’ll also need the embroidery frame and a cardboard box for pinning to. Of course you can substitute any pinning surface. I use cardboard boxes because I get them free at the grocery store and little bad kitties get to play in the boxes when I’m not sticking pins through them. Cast On 6 sts. Join to work in the round. … and it goes like that. Each new round has one more knit in it per repeat and each round gets bigger by 6 stitches. Pretty simple pattern. But getting it started can be tricky. Anything you start on such few stitches and work in the round has a certain level of fussiness to it. 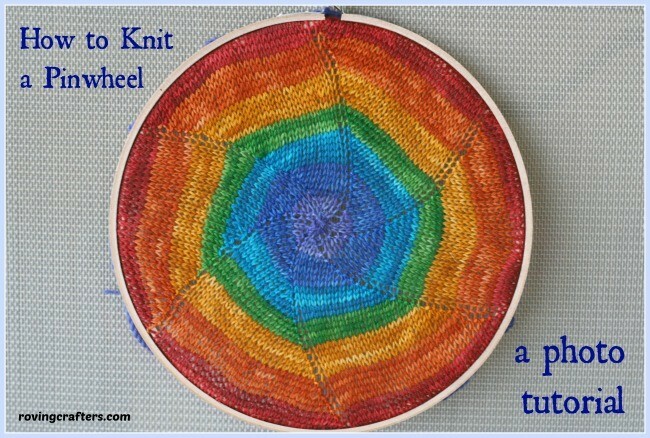 You can minimize that by using the magic loop method of knitting in the round. But if you don’t want to, if you prefer dpn’s, no worries. I have a method that makes it easier to handle those beginning rounds. 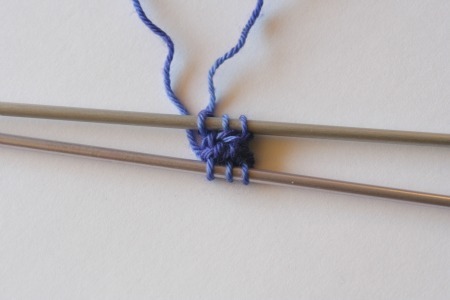 Step 4 – Spread the stitches across 3 needles, 2 on each and again… be careful not to let anything twist. 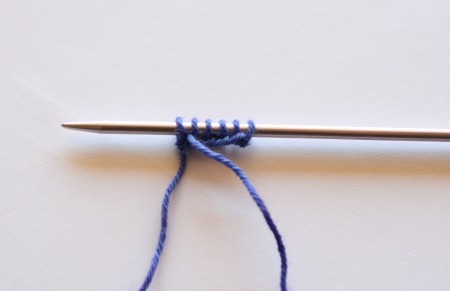 Step 7 – By the 10th or 12th round you’ll notice some puckering and some tension on your stitches. 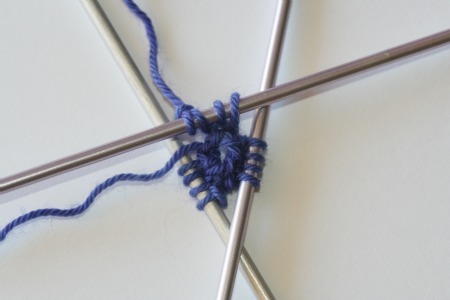 If its bothersome, or if your pinwheel is going to get big, spread the stitches out onto 6 needles. 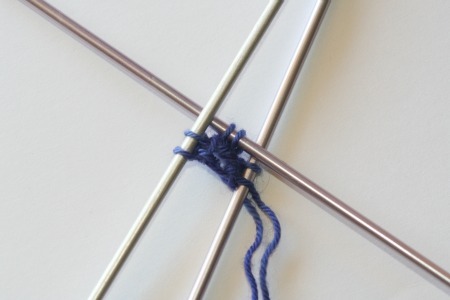 Place each repeat section on each needle. 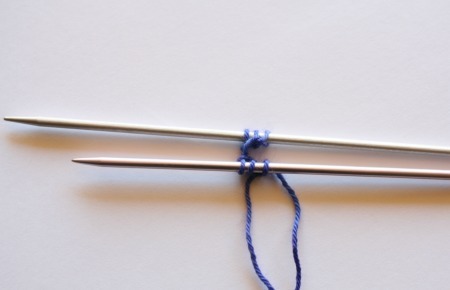 Step 8 – If your are knitting to fill an embroidery frame (like me) remember the stretch factor. I worked my pinwheel until it could fill the frame when stretched. Then I bound off. 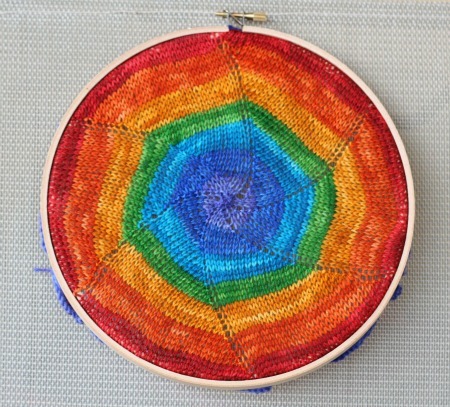 Step 9 – Place the center circle of the frame on your pinning surface. 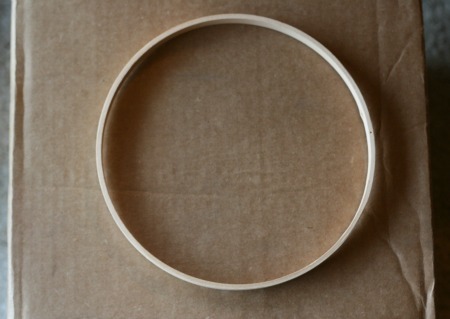 Step 11 – Set the outer circle of the frame and tighten it down. Remove the pins (of course!) then find a nice place to hang you pinwheel. So, what good are these, other than as wall hangings, if they curl? I like to use the pinwheel shape as a bottom on a circular bag. I made this part of my Carry Your Yarns – a bag for yarn! Pinwheels are a nice way to work a hat from the top down. 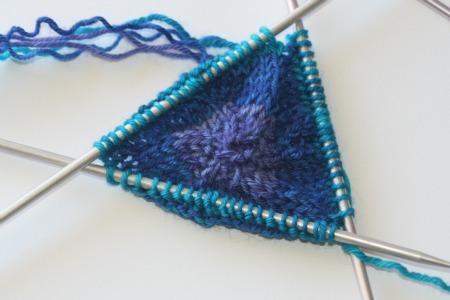 Some clever sweaters use pinwheels as a design element in the front and/or back. Check out the Pinwheel Drop Shoulder Pullover and the 94-5 Cardigan, both free patterns. Enjoy your pinwheels. May they memorize you and keep you happily stitching! 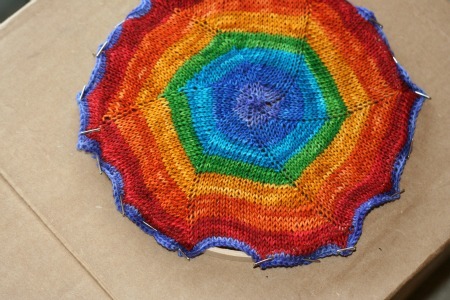 12 Comments on "How to Knit a Pinwheel"
could this be used as a circular lace weight shawl? I’d change the kfb’s to knits with yarn overs to help open up the fabric. You’d also need an extended knit lace edging, maybe even a knitted on border to fight that curl. It beautiful and it show’s off my yarn beautifully. Thanks for the brilliant idea and taking the time to make it for me. Your are the best. I wouldn’t have been able to do this without you!! Its the yarn that makes it beautiful! I used a variation of this pinwheel pattern (instead of increasing w/ kfb, it used yo’s) to make a killer lap afghan (gift for good friend) and it turned out awesome. My friend was overjoyed with it. And I wouldn’t hesitate to make another one like that, although starting out was the tricky part and I am very glad for Jen’s suggestions. Once they get started they go fast. Its a fun shape to knit isn’t it? Happy to provide the suggestions! And that crochet start is in truth the easiest. When no on is looking over my shoulder… that’s what I do. I have to master that magic loop and give this a try! Seems like great practice for increasing. 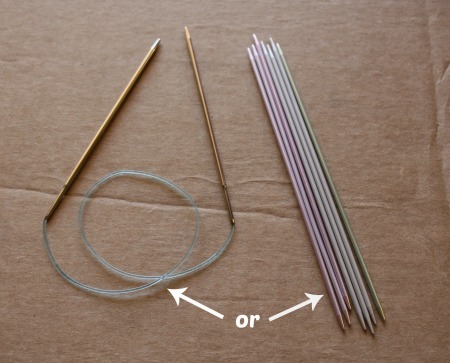 I’m DPN challenged, and I think I have to invest in some different circulars. I tried the crochet cast on with DPN’s, still dropped the needles. 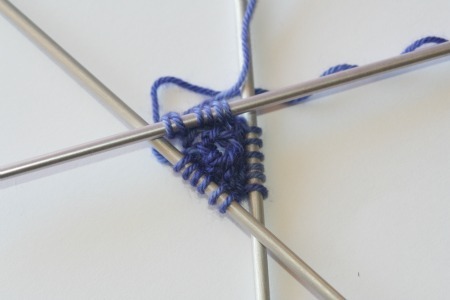 If you’re going for circulars, go for long & soft cords that transition smoothly to the tips. So much of a knitter’s difficulty in magic looping comes from using cruddy circulars! I am lucky to have her. Not just because she is a talented handdyer but because she is a good friend. I’d hang out with her even if she didn’t feed my yarn addiction, lol. But it is nice to have a yarn dealer on speed dial. Go get rest. Go get a foot rub. Go get your favorite ice cream. You deserve all that.